"From Mars to Pluto, wherever danger threatens the universe, you will find Dantro, the Planet Man, fighting for fair play." Created by Paladium Radio Productions sometime around 1950, The Planet Man is the story of Dantro, an employee of the intergalactic organization, the League of Planets, which is responsible for keeping peace in the universe. The law enforcement agency is headquartered on "Planeria Rex, the capital of all the planets in the universe. Little is known today about the series, not even the actors' names. 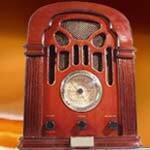 However, over 70 of the original shows remain intact for the entertainment and pleasure of young radio listeners.